I have the United Kingdom on the brain these days. First, there’s the royal wedding this Saturday (I’ve been invited to an early-morning watch party, and I’m making a Victoria Sponge). Second, next Saturday I’m headed to Scotland with my mom for a 12-day tour/adventure (!!!). 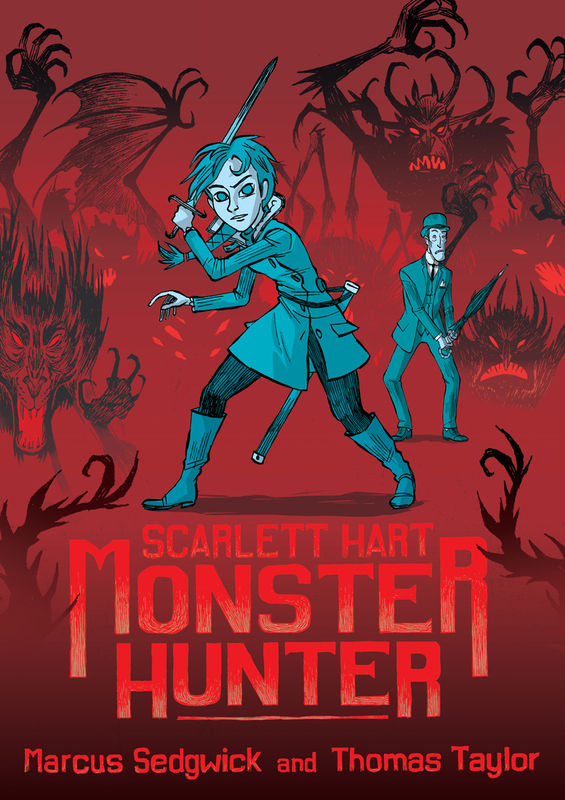 And thirdly, I recently read and thoroughly enjoyed Marcus Sedgwick and Thomas Taylor’s England-set middle grade graphic novel Scarlett Hart: Monster Hunter. Scarlett Hart, orphaned daughter of two legendary monster hunters, is determined to carry on in her parents’ footsteps—even if the Royal Academy for the Pursuit and Eradication of Zoological Eccentricities says she’s too young to fight perilous horrors. But whether it's creepy mummies or a horrid hound, Scarlett won’t back down, and with the help of her loyal butler and a lot of monster-mashing gadgets, she’s on the case. With her parent’s archrival, Count Stankovic, ratting her out to T.R.A.P.E.Z.E. and taking all the monster-catching rewards for himself, it’s getting hard for Scarlett to do what she was born to do. And when more monsters start mysteriously manifesting than ever before, Scarlett knows she has to get to the bottom of it and save the city... whatever the danger! In his first adventure for middle-grade readers, acclaimed YA author Marcus Sedgwick teams up with Thomas Taylor (illustrator of the original edition of Harry Potter and the Philosopher’s Stone) to create a rip-roaring romp full of hairy horrors, villainous villains, and introducing the world’s toughest monster hunter—Scarlett Hart! As you can tell from the title, this is the story of Scarlett Hart, the orphaned heir to a monster-fighting legacy. She has a trusty butler and housekeeper on her side and an old mansion filled with cool gadgets to her name, but not much else. She’s too young to officially fight monsters, and her fellow monster-fighting bounty hunters don’t respect either her age or her family name. In Sedgwick’s first foray into graphic novel territory, the action is pretty much non-stop, there are plenty of fight sequences, and cool gadgets, discoveries, and mysteries make their way into the narrative as well. It’s basically Sherlock Holmes crossed with Batman, with fantastical monsters and a preteen protagonist. In other words, reliable fun. The first page features a sea monster chomping down on a sailor, so it’s pretty clear from the get-go what you’re getting into. Young readers will identify with wanting to fight their own battles and make a difference, and the frustration of not being taken seriously by adults. Adults will want to take it at face value as a fantasy, and not murmur too much at the irresponsible parenting. All readers will enjoy the transitions from one monster emergency to the next, with some extra big-picture mysteries and a possible open door left at the end for further adventures. Now, the art! It was my favorite part of this book. The monsters were by far the best part – everything from zombies to ghostly dogs to sea monsters and more. It’s a field day for the imagination, but nothing gets so gory that a younger crowd can’t enjoy it. The color palette also enhance the story – darker, muted tones set a serious mood that complimented some of the lighter moments and contributed to the background scenery. In all, Scarlett Hart: Monster Hunter is a graphic novel with rousing adventure art that will appeal to monster-obsessed kids. Recommended for: graphic novel aficionados ages 10 and up, those who think a girl-powered Batman/Sherlock Holmes mashup sounds like fun, and fans of Jonathan Stroud’s Lockwood & Co. and Maryrose Wood's The Incorrigible Children of Ashton Place series. Fine print: I received a copy of this book for review consideration from the publisher. I did not receive any compensation for this post.